Imagine a universe where scantily-clad, objectified and anonymised women strut about mechanistically to daintily piano-led jazz-funk music that now evokes distant memories of late-1990s late-night music for Ceefax. Picture, if you will, the Dionysian racket of Motörhead - introduced oddly as 'Leatherhead' by presenter Tommy Vance - followed immediately by the saccharine tupperware pop of The Nolans. 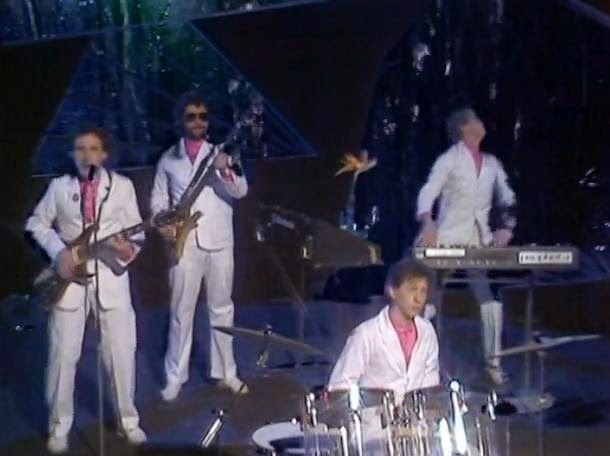 This edition of TOTP is epitomised by openers New Musik, complete with vaguely telefantasy-style watery set. If I haven't written about their From A to B album before, then that's a massive oversight: it's a lovely fusion of power-pop and synth-pop. The bassist appears thoroughly impassive, like a Jeff Lynne statue in large dark glasses. The keyboardist plays the fool, anticipating so much great Thomas Dolby geekery. 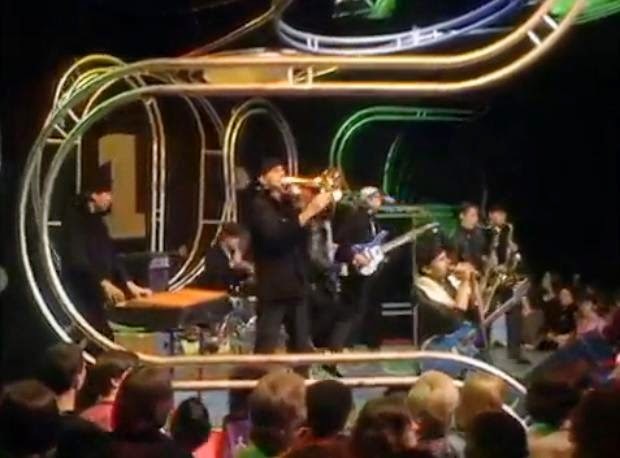 Wimbledon-born Tony Mansfield paces to the syncopated rhythm, both out-of-place and utterly comfortable on this Top of the Pops. Mansfield went onto produce Cleaners from Venus, responsible for that great unheard 1982 indie opus, Midnight Cleaners with its impossibly lovely jangling volleys like 'Only a Shadow' and the best askew pop essay in Englishness this side of XTC or Robyn Hitchcock. That New Musik didn't mutate into fixtures of the pop scene in Britain is testament to the usual British conservatism... That rare alignment of New Musik, Buggles, Korgis and McCartney II is one of the most delightful of 1980 English musical constellations. Disco's there - how could it not be? 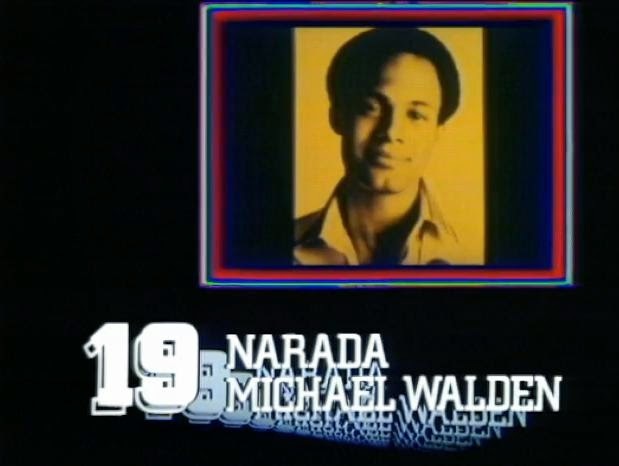 Narada Michael Walden's 'I Shoulda Loved You' shimmers gorgeously, with its soul-jazz horns and elemental groove. Slightly less compelling is the reappearance of a latter-day Jimmy Ruffin, in a Hawaiian shirt, belting out some mildly Barry White-esque soul ballad on a balcony. The 3-4 years late 'punk' brigade seem to fill one or two slots in every 1980 TOTP show, and The Chords are eminently forgettable in a sub-sub-The Jam style. The distinct heavy metal presence is different to most 1970s charts, and Tommy Vance is the apposite host, pronouncing 'lovin'' naturally without the 'g'. The genre has been on my mind, what with Marcello Carlin's sterling writing on Iron Maiden and Def Leppard on Then Play Long. And, also, Jeremy Deller's exhibition-come-treatise All That is Solid Melts into Air, which I saw at the Laing art gallery in Newcastle, which used Saxon's 'Wheels of Steel' as one of its video exhibits - the Sheffield band who appear in this very TOTP. The conceptual exhibition also included popular broadsides from the Victorian era, including one imagining a future utopia of 1973, as well as family trees of the Messrs Ryder, Holder and Ferry. Deller is from the more analytical, socially engaged end of conceptual art; ironically, given his Marshall Berman-citing title regarding modernism, his connections became ever more concrete the more you moved around the exhibition and thought. De-industrialisation was being experienced by young men in places like Sheffield; not just Mick in Barry Hines and Ken Loach's 1981 film Looks and Smiles, but Saxon and their 'Steel City' contemporaries. As Deller argues, heavy metal is hewn from the memories of industry and its noises. Then, there is the uncannily serene slice of jazz-funk I alluded to at the start. Legs & Co. function as, well, legs and assorted objects to accompany this almost chillingly calm piece of music: 'The Groove' by Rodney Franklin. Sophisticated in a manner perhaps only achievable by instrumental jazz-funk of this era. The fifteen year-old Gilles Peterson would surely have enjoyed this, even if it is like the super-ego to the id of Incognito, Cymande or Hi-Tension, a wonderful strain of British music he played much of on last week's show. During the 24/04/80 show, Steve Wright remarks: "Nice to see something so unusual in the charts" - and he says that of Sky... The same show included a one-two of The Cure's 'A Forest' and Elvis Costello's 'High Fidelity'. There's more here; we don't just have an ode to UFOs with a drone-like long introduction from supposedly 'safe' Hot Chocolate, but also Kate Bush's 'Breathing', one of the most horrifying and gut wrenching of any responses to the Second Cold War and the threat of nuclear doomsday. It's from the same album as the crystalline John Dowland-as-subtle-protest-song 'Army Dreamers'. If you aren't into Kate Bush by this stage, then your taste is unfathomable to me! There's no more radical place to start than Never for Ever and The Dreaming and start all should. The Beat - 'Mirror in the Bathroom': a window on a whole new world, to paraphrase the great Dennis Potter. And Dexys Midnight Runners are at number #1, with 'Geno'. It may not quite be my favourite of theirs: that is 'This Is What She's Like' from five years hence. But it is another evolutionary step as a number 1, following 'Going Underground' a month or two earlier. To add to the unexpectedly purplish standard, we are thankfully not treated to B.A. Robertson, a bane of this era and, not so much a poor man's Ian Dury, as a 'wacky' Bob Willis, Sky TV's inveterate misanthrope of a cricket commentator (now sentenced, Rochester style, to inserts in the studio). This episode also spares us the egregious Steve Wright, arms flung 'chummily' around invariably female and voice-less audience members. The audience lasses are permitted but a few words by Vance, and no, sadly, they aren't colloquial or choice ones. Of course, when introducing the Cockney Rejects, Wright emits an unspeakable 'amusing' blend of cockerney and his mid-Atlantic RP: witness this and cringe. Alas, this installment doesn't quite avoid Johnny Logan, as his 'What's Another Year' plays over the yellow credits. Yes, blandness, or beigeness in Kate Tempest's terms, always asserts itself in British culture, even amid the more awakened musical culture of 1978-82. However, this programme is generally of a different, stellar order to 1976 TOTP, which I wrote about over three years ago here. We are seeing the infiltration of subcultures and artistry of an altogether weirder and fresher hue, led by talismans such as Kate and Kevin and overseen with wisdom and lightness of touch by a 37-year-old Scouser named Paul. For the moment, commercial compromise and cynicism seem to have been kept out, with the hapless Nolans the ones marooned and marginalised. Bizarrely, BBC-4 ordain to show an edited thirty minute version on Thursday evenings, and then the full forty or so minuter later in the early hours of Friday (here it is on iPlayer). Needless to say, the edit is superfluous. As a friend has rightly argued, they should further contextualise the show in its era by accompanying the TOTEP re-runs with repeated dramas like Play for Today or documentaries like Russian Language and People - which is at least partially available here, happily. Tommy Vance unfurls a one-liner, following New Musik's sprightly opening number... "Just a minute I thought I was going to drown there, but luckily I didn't." As Richard Hawley would appreciate, the ocean is bountiful and strange enough to desire immersion. Bluehost is one of the best hosting company with plans for any hosting needs. "Fun for all the family? I don't know how they have the nerve!" Old Woman Swears: "Mrs Brown's Boys"
(c) Tom May, Robin Carmody, David Lichfield, Luke Aspell, Ed James. Watermark theme. Powered by Blogger.